Starred with Bob Hoskins in the BBC's Othello. 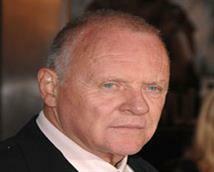 Anthony Hopkins and Bob Hoskins are two actors separated by one letter. He has worked with 12 directors who have won an Oscar for Best Director: Tony Richardson, Richard Attenborough, Robert Wise, Michael Cimino, Jonathan Demme, Francis Ford Coppola, John Schlesinger, Oliver Stone, Steven Spielberg, Ron Howard, Robert Zemeckis, and Woody Allen. He appeared in three films with Anne Bancroft: Young Winston (1972), The Elephant Man (1980) and 84 Charing Cross Road (1987). Graduated from the Royal Welsh College of Music and Drama in Cardiff. Was offered the lead role in Gandhi (1982) by Richard Attenborough. When Hopkins called his father to tell him, his father responded with: "Oh, its a comedy then is it!?". He appeared in five films directed by Richard Attenborough: Young Winston (1972), A Bridge Too Far (1977), Magic (1978), Chaplin (1992) and Shadowlands (1993).